Big thanks to the publishers and authors for the following review copies received, and be sure to click the links to their Goodreads pages for more details and full descriptions! My thanks to Titan Books for Occupy Me by Tricia Sullivan, which made a big splash last year and was a nominee for the 2017 Arthur C. Clarke awards. I hear that it’s on the weird side, but the premise sounds so interesting that I can’t help feeling a little curious, so I’ll probably check it out. 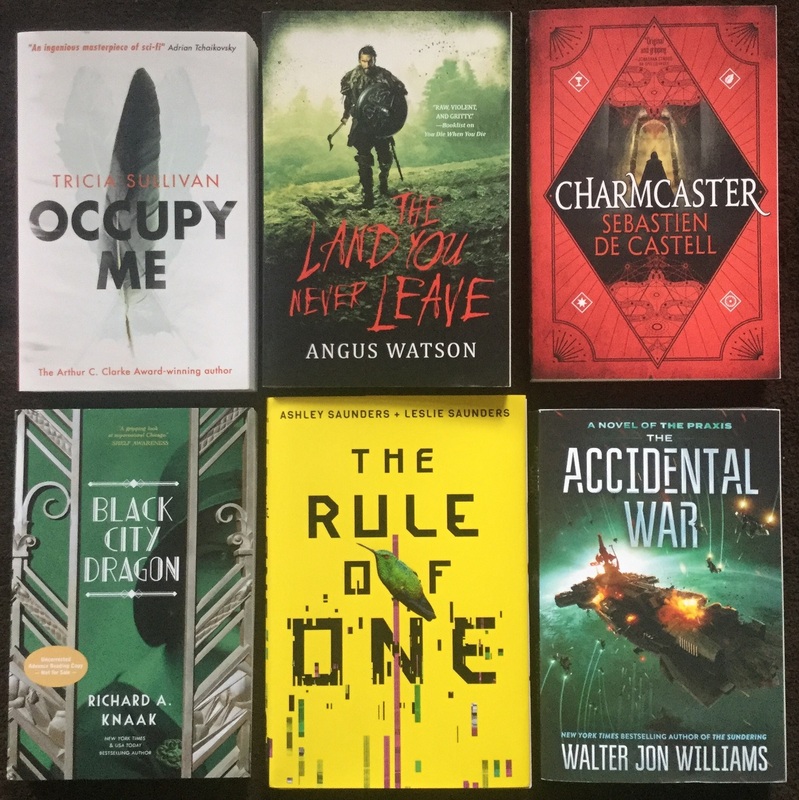 From the awesome team at Orbit, I also received the following finished copies: The Land You Never Leave by Angus Watson is the sequel to You Die When You Die, a book I really enjoyed, so I’m doubly looking forward to reading this one. 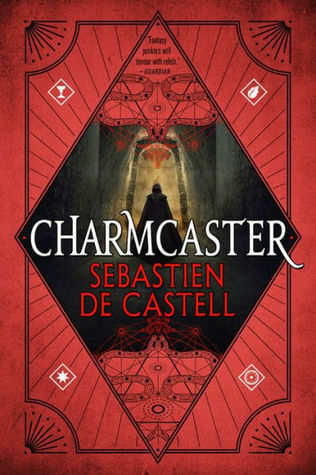 Charmcaster by Sebastien de Castell has already been read and reviewed, and it was another fun installment in the brilliant Spellslinger series. Also a big thanks to Pyr Books for this ARC of Black City Dragon by Richard A. Knaak. I know I’m painfully behind on this series, but one day I will catch up! 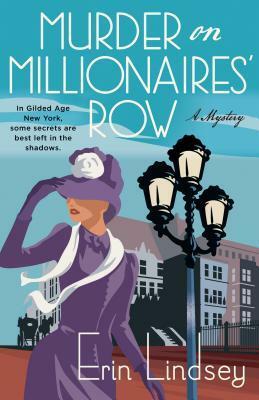 Described as a historical urban fantasy combining action, mystery, and romance set in Prohibition-era Chicago, this just sounds too good to pass up. Up next is The Rule of One by Ashley Saunders and Leslie Saunders, which was unfamiliar to me. 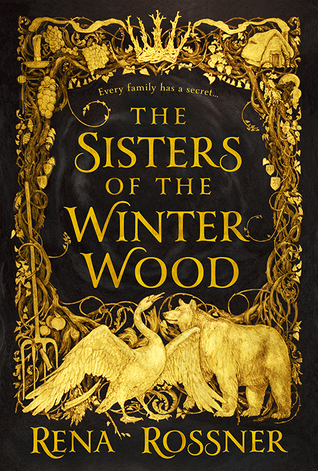 After some digging though, I discovered that it is a near-future YA sci-fi dystopian about a pair of twin sisters, written by a pair of twin sisters. Pretty neat, and the premise sounds interesting too, so I might check it out if time allows. Thank you Skyscape and Wunderkind PR for putting this one on my radar. And my thanks to HarperVoyager for sending me a finished copy of The Accidental War by Walter Jon Williams. I’ve heard of the author and his Dread Empire’s Falls series, though I’ve never read any of the books. This one is apparently the start of a new trilogy set in the same universe. Thing is, I’m not sure how much I need to know about the previous trilogy or whether I can just dive right in at this point as a new reader. If anyone knows, feel free to chime in! This next one I’m super excited about: Empress of All Seasons by Emiko Jean is a YA fantasy with East Asian influences featuring a protagonist who is secretly a yōkai (a supernatural spirit in Japanese folklore) training to be empress. But if her true nature is discovered, her life will be forfeit. 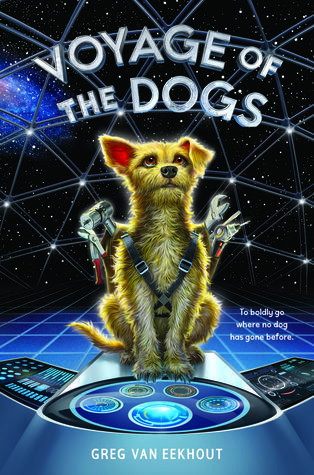 Needless to say, when the publisher contacted me asking if I would be interested in an ARC, I said yes right away. With thanks to HMH Books for Young Readers. Earlier this month I was also lucky enough to score an ARC of Lies by T.M. Logan from a Shelf Awareness sweepstakes. This is a thriller I’ve had my eye on for a while, and I couldn’t believe it when I won a copy. I’m definitely going to be reading this one soon. Thank you to St. Martin’s Press for the opportunity. I also want to thank the kind folks at Tor.com for sending me an ARC of The Black God’s Drums by P. Djèlí Clark. 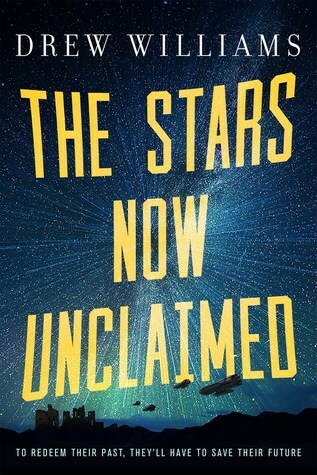 Smuggler airships, kidnapped scientists, and mysterious weapons, oh my. Add to that a supernatural element in the form of divine powers granted by the orisha of wind and storms, and this sounds like an amazing adventure. And finally, rounding up this week’s new arrivals, I would like to thank the kind folks at Ace/Roc/DAW for the following finished copies: The Late Great Wizard by Sara Hanover is an urban fantasy about a magician’s daughter and her enigmatic quest to find her father after he vanishes mysteriously, and Worldshaper by Edward Willett is the first book of a new portal fantasy series featuring a young woman who discovers she has the powers to unlock an infinite possibilities of new dimensions. I’ve heard great things about both books, which are going onto my fall and winter TBR. 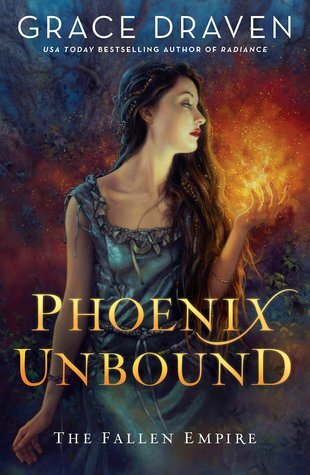 And of course, last but not least is Phoenix Unbound by Grace Draven, which you probably know I loved if you caught my review earlier this week. 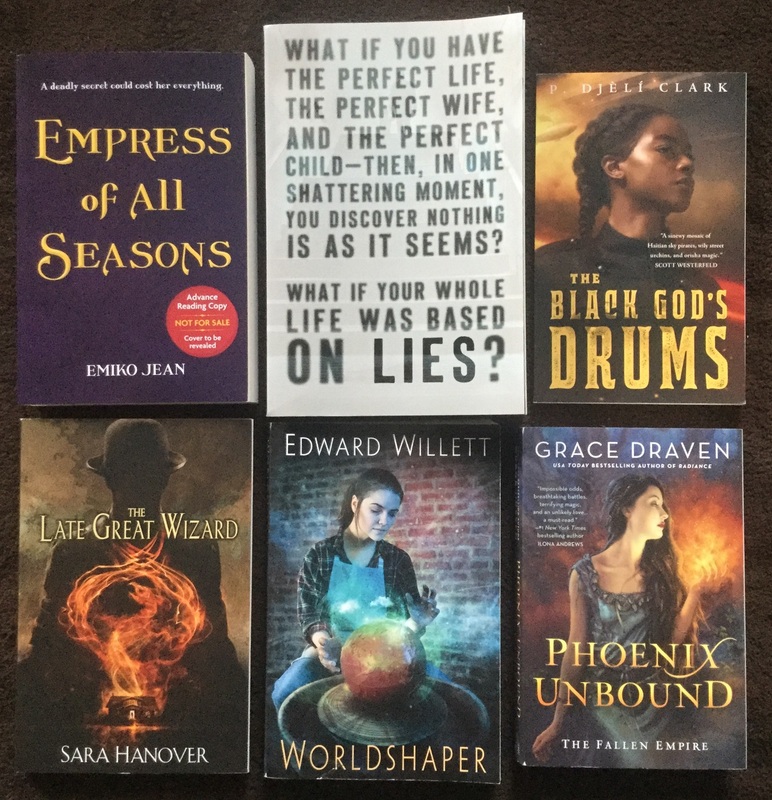 If you’re a resident of the US, there’s still a couple more days to enter my giveaway, so be sure to check out the link to the details in the sidebar. 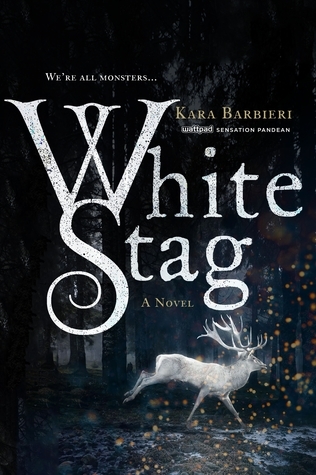 Well, I almost made it through the two weeks without requesting from NetGalley, but earlier in the week I caved on White Stag by Kara Barbieri when an email popped up in my inbox from the publisher offering the eARC as a Read Now. What can I say, I can never resist a Goblin King story. With thanks to Wednesday Books. Here’s what I’ve managed to “unstack” from the TBR since the last update. I’m on a roll! A few of these have already been reviewed, but stay tuned, because more are coming soon. It is a common trope, I agree! I hope the awesome setting will make up for it though! Black City Dragon does sound interesting, and The Rule of One sounds really unique. Lies definitely has me interested as well. Looks like a pretty awesome review line up! Knaak’s series is one I really need to check out! And I’m hoping I’ll have time this month to check out Rule of One, because it does sound pretty good. I still need to try Angus Watson-I have a few of his books on my ereader but at the moment I’m trying to concentrate on reading mostly paperbacks in the hope of creating room on the bookshelves that are stuffed! He’s amazing! But you gotta brace yourself though, his books can be pretty brutal, especially his Iron Age trilogy! Ooh nice new reads! Some new to me ones here and a few familiar faces too! Haven’t read any though. I hope you enjoy them all! Thank you, happy reading to you too! All those beautiful covers!! I’m sure the words are nice too! I really enjoyed The Black God’s Drums. 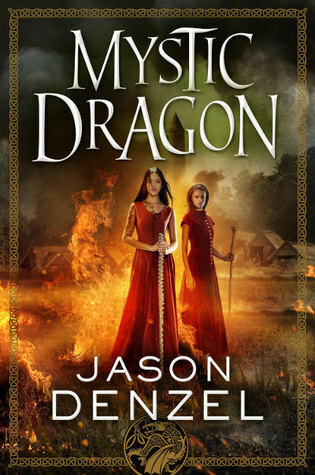 Great alt history fantasy. Fun! I saw that White Stag email but gritted my teeth and resisted! Someone from Orbit saw my comment on someone’s review of You Die When You Die and sent me a copy! I was pretty surprised, 1. That publicists are reading comments, and 2. That she was kind enough to send it to me. I can’t wait to read it! 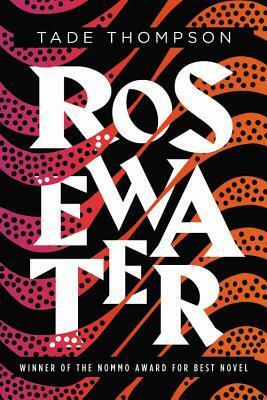 I definitely want that Angus Watson book – I loved the first and so will have to pick up a copy soon. Unfortunately, as with all my bought books though, they always play second fiddle to review copies. I have 3 and 4 of the Charmcaster books to catch up with and hoping to pick those up soon. I also want to read Phoenix Unbound – it has such glowing reviews. I can’t wait to read The Land You Never Leave! 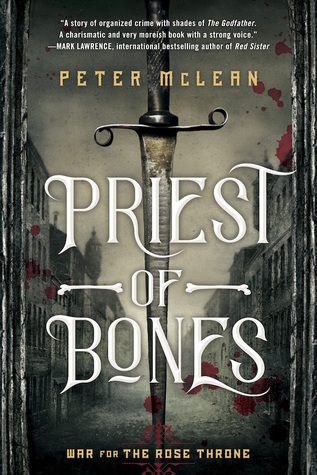 The first book was so good, I’m really looking forward to see where the Mushroom Men will go next. And I know what you mean about the bought books piling up – I really have to stop buying any more! oh many intriguind ones there! Happy reading my friend! Happy reading to you too Melliane! People have been praising that one left and right, can’t wait to check it out! I keep meaning to read Walter Jon Williams’ books — I hear *such* good things. I’ve never read him! Some of the things I’ve heard have made me curious! Looks like you have a lot of great stuff on the horizon. I am really tempted to start that de Castell series but I’m in the middle of so much other stuff at the moment lol. Nice haul, Mogsy! (Then again, your hauls are always good ones – enviable, even.) I think I’ve seen Worldshaper somewhere else recently, so I’ll definitely be interested in hearing more about that one if/when you review it. I was tempted to get White Stag, too! I look forward to your thoughts. I’m also curious about The Role of One. It was one of Amazon’s First Read choices, but I decided to grab a different book.